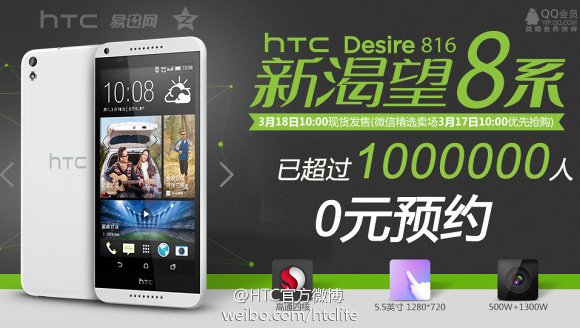 The HTC Desire 816 is enjoying some healthy interest over in China.We previously reported that HTC shares rose amid 450 thousand pre-orders of the handset in China and now the number surpasses 1 million pre-orders. However these, at the moment 1,176,185 million pre-orders, are non-committed ones. This means that no actual moneys has been sent and you only need to click to pre-order the device. So at the end when the phone needs to be shipped there's no telling whether all these people will go through the pre-order process and send in the cash (1,899 CNY is around $308). It's a similar situation to the Nokia X's not-1-million-pre-orders. The number is still pretty impressive and it looks like HTC has made a good move with the device and its price in China as the interest, money-backed or not, is there. why is beats logo not on it. ?